The Friends of the Library is an auxiliary group organized to “foster, encourage, sponsor and promote the perpetuation, improvement, and interest in the Rutland Free Library.” The Friends welcome new members at all times. Pick up a membership form at the circulation desk. Meeting times are posted, usually the 2nd Monday of the month. In addition, the Friends are currently recruiting new Board members. Notify the nominating committee (email friends@rutlandfree.org) if you are interested in serving on the board for a two-year commitment. Voting occurs at the annual meeting. The Friends sponsor frequent book sales throughout the year as a fundraising event. 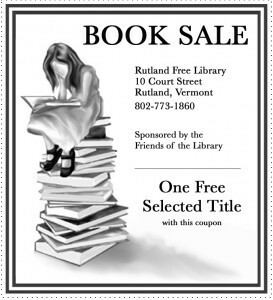 For more information, or to volunteer to help out, you may contact the President of the Friends of the Rutland Free Library by emailing friends@rutlandfree.org.